Moving to a new PC can be an exciting time. You'll probably have a more powerful processor, larger hard drive, faster networking and I/O, a better monitor maybe, with all kinds of other new possibilities to explore. If that sounds too much like hard work, though, keep in mind that there is an alternative. 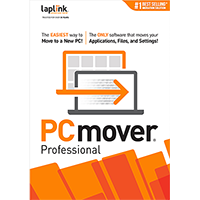 Laplink's PCmover Professional 10 is a powerful, yet surprisingly simple tool which can automate the process of transferring all your chosen applications, settings and files from one setup to another. If your system has several user accounts, that's not a problem: PCmover Professional can transfer any or all of them, even preserving the security details about who owns which files. And if your particular migration doesn't seem so straightforward, don't worry: the program supports several scenarios. If you're moving from one PC to another, for instance, then as long as you can connect the two - either directly, or just have them visible to each other on the same network - PCmover Professional will be able to transfer your data at very high speed. You can't connect them? Not a problem. The program can also save the data from your old system to a file, for instance on an external or network drive. As long as your PC can access that file, then PCmover Professional will be able to migrate your files with ease. And if, actually, all you're doing is planning to perform an in-place upgrade by installing a new version of Windows on a single PC, then the program can help there, too. PCmover Professional 10 now includes the Windows Upgrade Assistant, which allows you to upgrade to Windows 10 or 8, then automatically restores your applications, settings and data. While PCmover Professional 10 sounds like it should be complex - and the program does have a lot of very tricky work to do - in operational terms it's surprisingly easy to use. After a straightforward installation, for instance, PCmover presents its familiar, wizard-like interface. And once you've chosen whether you want to run an in-place, or PC-to-PC transfer, the migration process proceeds with surprising speed. And it really is fast. The questions you're asked are simple, and clear: "is this the new or old PC? ", "how are the PCs connected? ", and so on. There are only a few of them to answer. And PCmover scanned our old system, collecting together information on all the applications, files and settings we could transfer, in less than 45 seconds. Life becomes a little more involved when you move to the new PC, of course, but it's still not particularly difficult: essentially you just have to define exactly which programs you want to transfer, check the program's copying the files and folders you need, and so on. If you do run into any problems, Laplink offer free transfer assistance; just call 1-877-904-9644 if you're in USA or Canada, 0800 092 7925 for UK users, or 1800 653 093 if you're in Australia. Alternatively, visit www.laplink.com/FTA if you're outside of these territories. Once everything is set up, all you really have to do is wait for the PCmover installation on your old PC, to complete the transfer to its cousin on your new system. Which may take a while, particularly if there are hundreds of gigabytes of data involved. But even here the program does its best to help, offering to send you an email or text message when the job is done. PCmover Professional 10 cannot solve every migration problem, of course. In particular, while the program can move your applications to a Windows 10 system, it can't make them Windows 10-compatible. And so you really need to check your software for compatibility before you do anything else. What PCmover Professional 10 can do, though, is save you an enormous amount of time and hassle by automating the bulk of the migration process. And that's good enough for us. Note that this is Laplink Professional v10 with a single (1-migration) license, meaning you can use your license code to transfer one computer within your household or small business department. Ideal for moving your data and installed apps to a brand new Windows 10 PC. PCmover can migrate your PC across a network, Laplink USB cable, Laplink ethernet "Easy Transfer Cable" or any type of removable media that can be read by both PCs. 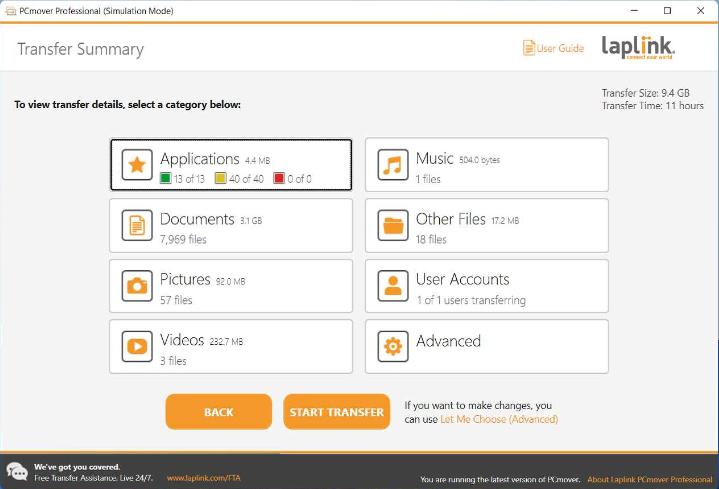 If your computer has multiple users, PCmover gives you the option to migrate some or all of the users at once. The security information about file ownership and access control is preserved for each user. You can even use PCmover to migrate your PC to an Intel-based Mac using VMware Fusion, Parallels or Bootcamp. Note that PCmover does not include the file transfer cable. You can purchase this separately from this store. After purchasing Laplink PCmover Professional, if you do run into any problems, Laplink offer free transfer assistance; just call 1-877-904-9644 if you're in USA or Canada, 0800 092 7925 for UK users, or 1800 653 093 if you're in Australia. Alternatively, visit www.laplink.com/FTA if you're outside of these territories. © 2010-2019 Dennis Publishing Ltd, 31-32 Alfred Place, London, WC1E 7DP, is a company registered in England and Wales with company registration number 1138891.